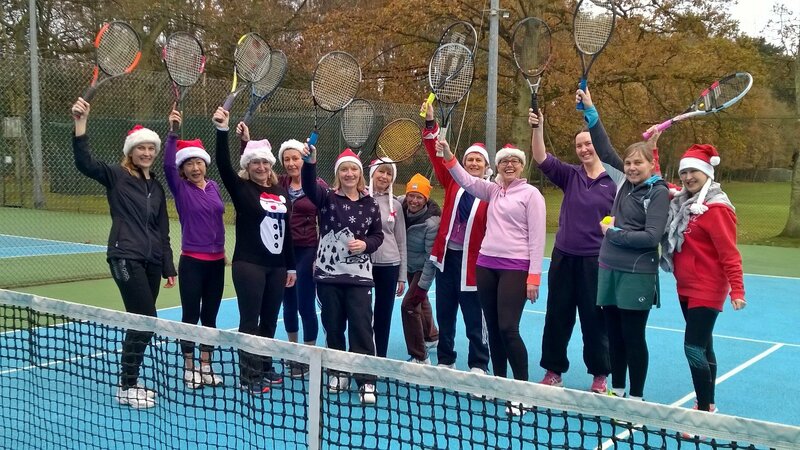 The weather was certainly not very festive, but there were 14 ladies all playing tennis today for a couple of hours before tucking into the generous display of cakes, biscuits, mince pies and other festive fare. Ladies played four games to the loud blare of well-known Christmas tunes. Then they moved on to another court, through an ingenious system understood only by Jenny P – but everyone was happy to participate, and it really mixed the ladies up, so everyone got to know everyone else. As the evening drew in, some ladies continued to play under flood lights for another 30 minutes or so, whilst others preferred an early tea! Our Ladies captain came to cheer us on, even though she is still injured and unable as yet to join in. We had one lady just back from producing the next generation of tennis players, and happily back on court, and another lady who has just stopped playing because she is going to produce a very young tennis player in 2018. Everyone seemed to enjoy the afternoon, and we are looking forward to the next one, on Sunday 7th January 2018, from 2-4pm as usual. All ladies welcome! It will be publicised on Facebook (Crowthorne and Wokingham Gossip Girls, amongst others) – please tell your friends!